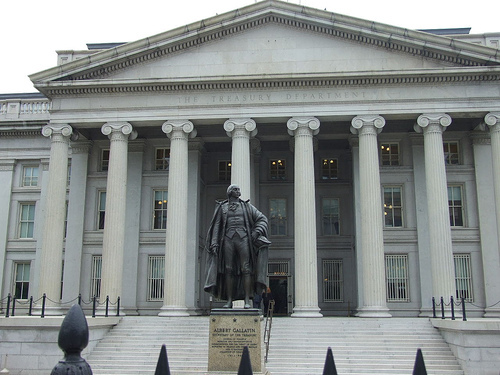 WASHINGTON (Reuters) – The U.S. government fell deeper into the red in fiscal 2010 with net liabilities swelling more than $2 trillion as commitments on government debt and federal benefits rose, a U.S. Treasury report showed on Tuesday. The biggest increase in net liabilities in fiscal 2010 stemmed from a $1.477 trillion increase in federal debt repayment and interest obligations, largely to finance programs to stabilize the economy and pull it out of recession. The federal balance sheet liabilities do not include long-term projections for social programs such as Medicare, Medicaid and Social Security, but these showed a positive improvement. The report said the present value of future net expenditures for those now eligible to participate in these programs over the next 75 years declined to $43.058 trillion from $52.145 trillion a year ago — a change attributed to the enactment of health-care reform legislation aimed at boosting coverage and limiting long-term cost growth. The overall projection, including for those under 15 years of age and not yet born, is much rosier, with the 75-year projected cost falling to $30.857 trillion from last year’s projection of $43.878 trillion. – Federal Reserve To America: We Will Continue To Nuke The US Dollar!